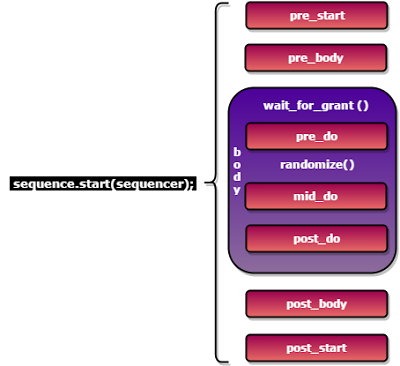 Sequence generates series of sequence_item's and send to the driver via sequencer, Sequence is written by extending the uvm_sequence. 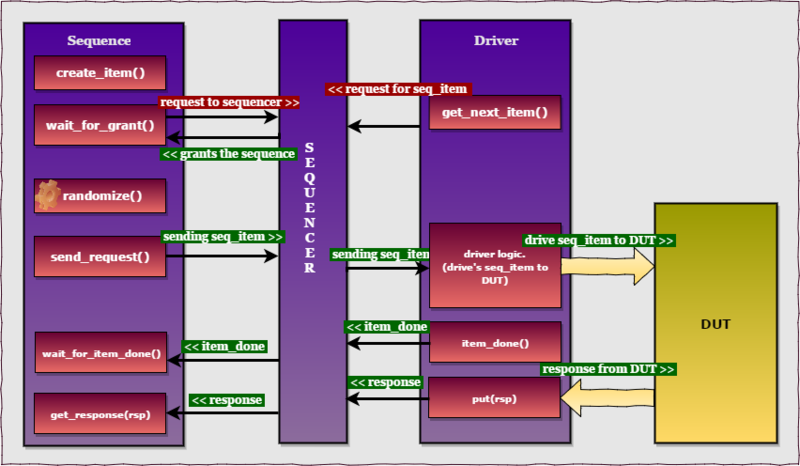 A uvm_sequence is derived from an uvm_sequence_item and it is parameterised with the type of sequence_item, this defines the type of item sequence will send/recieve to/from the driver. sequence has handle req and rsp of mem_seq_item. A transaction that provides information to initiate the processing of a particular operation. A transaction that provides information about the completion or status of a particular operation. body method defines, what the sequence does. The m_sequencer handle contains the reference to the sequencer on which the sequence is running. Sequence will get executed upon calling the start of sequence from test. sequencer_name specifies on which sequencer sequence has to run. There are Methods, macros and pre-defined callbacks associated with uvm_sequence. User can define the methods(task or function) to pre-defined callbacks. these methods will get executed automatically upon calling start of the sequence. These methods should not be called directly by the user. Below block diagram shows the order in which the methods will get called on calling the start of sequence. Logic to generate and sending the sequence_item will be written inside the body() method of the sequence. 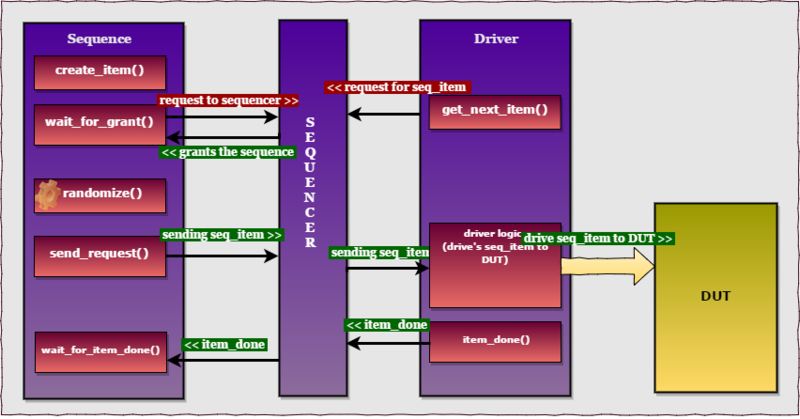 The handshake between the sequence, sequencer and driver to send the sequence_item is given below. *steps 5 and 6 are optional. Create and initialize* a sequence_item or sequence. *initialize - initialized to communicate with the specified sequencer. This method call is blocking, Execution will be blocked until the method returns. 1. This method issues a request to the current sequencer. 2. The sequencer grants on getting get_next_item() request from driver. Send the request item to the sequencer, which will forward it to the driver. If the re-randomize bit is set, the item will be randomized before being sent to the driver. This task will block until the driver calls item_done or put. If the sequencer is not currently executing an item, this method will return null. receives the response from driver. // assert(req.randomize());, will return the assertion error on randomization failure. These macros are used to start sequences and sequence items on default sequencer, m_sequencer. This macro takes seq_item or sequence as argument. On calling `uvm_do() the above defined 6 steps will be executed. This macro creates the item or sequence. create() and randomize() are skipped, rest all other steps are executed. Only create() is skipped, rest all other steps are executed. This macro performs above 6 steps along with constraints defined in second argument. create() is skipped, rest all other steps are executed along with constraints defined in second argument. Performs `uvm_do() with priority mentioned. Performs `uvm_do() along with constraints defined and priority mentioned. create() and randomize() are skipped, rest all other steps are executed with priority mentioned. Only create() is skipped, rest all other steps are executed with priority mentioned. create() is skipped, rest all other steps are executed along with constraints defined with priority mentioned. This macro is used to declare a variable p_sequencer whose type is specified by SEQUENCER. by using p_sequencer handle, properties of sequencer can be accessed. The m_sequencer handle contains the reference to the sequencer(default sequencer) on which the sequence is running. The p_sequencer is a variable, used as handle to access the sequencer properties.